Winters and his team need to steal the mask of a voodoo priest from their employer, Markus Schrecken. Winters pays Schrecken a visit in the middle of the night, surprising him in bed with two young women, to argue with him about the job Schrecken has hired him to do - steal a ghost. The argument is a distraction, though, and while Winters and Schrecken verbally spar, Anderson, Trick, and King sneak around the mansion and Trick uses sleight of hand to steal the mask. The team then returns to the Trask mansion, where the medium, Edzia, attempts to commune with the ghosts. Although she does not seem successful, in other parts of the mansion, other team members are attacked. Joe Burns is attacked by a ghost in the video editing room. And Winters sees a vision of a young woman who asks him to save her, and then is thrown off a balcony with a noose around his neck by an unknown stranger (possibly a ghost). King says to steal the ghost they may need to have it possess one of them.... but no one is aware that Joe and Winters may be hurt, dying, or even dead. This is another haunting occult tale from Joshua Williamson, who is really starting to hit is stride with the story. Winters comes across as a sort of criminal "James Bond" character -- daring, confident, and willing to take huge gambles for a big payoff. Anderson didn't seem quite so ruthless in this issue, although I did find it surprising that she was willing to participate in the theft of Schrecken's mask (since he is her employer). King, the skeptic, continues to be a favorite of mine. I enjoy watching him pshaw impatiently at those who believe in ghosts. Edzia continues to be a bit of a mystery. She keeps telling the team that she can't sense ghosts while we, the reader, can see the ghosts appearing in the mansion. Either she is a real medium who senses the ghosts and is lying to the team, or else she is a fraud, and is not really able to sense ghosts. I suppose it's possible that she could have true powers but that something is interfering with or preventing those powers, but I judge one of the first two possibilities as the most likely. The action has gotten better in this issue. The ghosts, about whom we had only seen hints before, are now starting to manifest themselves in more real, physical ways. Clearly something strange is going on in the Trask mansion, and it will be interesting to see how the team deals with the ghosts now that they are going on the attack. For example, I'm not sure what Anderson's guns and knives will do against spirits. The artwork was again solid in this issue. The moody, brooding style is entirely appropriate for the story presented here, and Sudzuka does a good job with facial expressions. The cover by Sean Phillips looks great, with excellent ghosting effects. Overall, this was another solid performance by the creative team, and so far the most enjoyable of the three issues. The characters are really starting to come into their own, and the story has become more and more interesting. 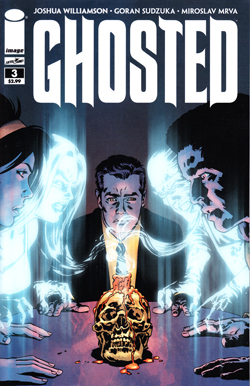 The only negative thing I have to say is really about the future -- although the premise is good to this point and I am really enjoying it, I find it hard to picture how the team will stay together once they capture the Trask ghost and deliver it to Schrecken. I certainly hope they do stay together and have more adventures like this one... but I'm not really seeing how Williamson is going to get them there. Perhaps this means that the series will be short-lived, but if so, I'm certainly along for the ride at this point.